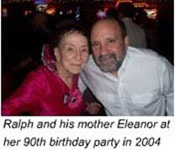 Ralph's mother Eleanor McElroy ran McElroy Translation Company and I knew Ralph as the laid-back hippie lover who operated the Les Amis Cafe behind the Varsity Theatre on the Drag in the late 60's and on. He was introduced to me as a good friend of my friend and car mentor Charles Garrett. I don't have any fond memories that I can share about Ralph because they are clouded by all the people around him who failed to pass my messages because they didn't "know" who I was to him. They didn't know our history from 1969 thru 1974 during the tumultuous times of hippidom in Austin Texas with the rise and fall of the SLA, SDS, Black Panthers and the like. And I couldn't tell them. Now I can but just simply won't.